For the armchair environmentalist/cook—in other words, those of us with good intentions who need a little reading material to truly inspire the lazy right out of us, Michael Pollan’s exceptionally lucid book, The Omnivore's Dilemma: A Natural History of Four Meals (featuring Virginia’s own Joel Salatin of Polyface Farm), has become the gold standard of references about current thinking in organic farming and localism, besides being a great read. 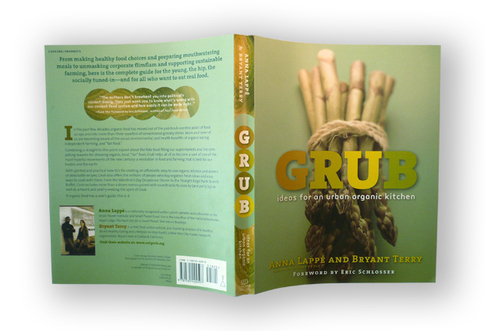 Grub: Ideas for an Urban Organic Kitchen by Anna Lappé and Bryant Terry (Tarcher/Penguin), is even better, because while it dissects commercial and organic farming practices as it makes its argument for localism, it also goes into effects on our health, and has a nice section on practical steps to go green. Lappé (daughter of Frances Moore Lappé, author of Diet for a Small Planet ) and Terry deconstruct the hidden costs of cheap food ("The Six Illusions") and the dominance of the organic market by major corporations like Heinz (Hain Celestial), M & M Mars (Seeds of Change), and General Mills (Cascadian Farm). Best of all, their book’s got a whole bunch of great recipes with printable shopping lists for each on Lappé and Terry’s website, Eat Grub. Try the flavor-packed shrimp and veggie kabobs (p.167) or the fresh beans with garlicky citrus vinaigrette (p. 169) for an easy blast of organic eating. To read more about cooking and eating green, follow this link to HomeStyle (the issue with the fabulous cover), and this one if you're thinking about a greener kitchen. i picked up "grub" at a local market and have really enjoyed it. thanks for giving it a shout-out. 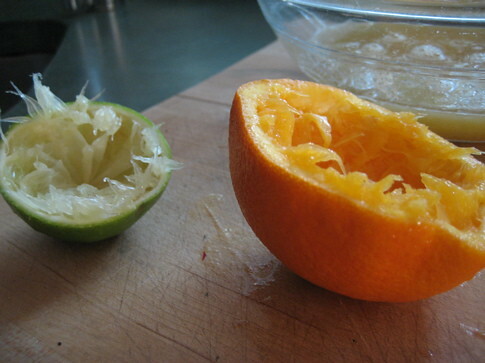 it is excellent to see a follower to "diet for a small planet." thanks for the heads-up. Am reading Barbara Kingsolver's latest, Animal, Vegetable, Miracle- its a great read- a como of family drama and organic farming. Alice Water's new book on seasonal cooking just came out this week as well. Lots of eating and reading to do ! This book has been on my shelf for a year and I haven't given it much time at all. Thanks for reminding me to take another look. I swear you and me should do a cookbook swap sometime. Play-with-food.blogspot.com on Maybe Magical Meals?